Michelle Madow: Free Book Friday Giveaway: Storm by Amanda Sun! Free Book Friday Giveaway: Storm by Amanda Sun! 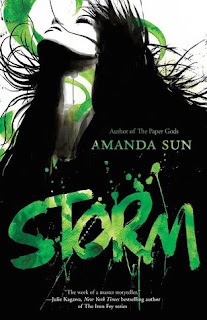 This Friday I’m giving away Storm by Amanda Sun, to celebrate it’s release this week! The giveaway is international, as long as you live in a country where Book Depository ships to. After almost a year in Japan, Katie Greene has finally unearthed the terrible secret behind her boyfriend Tomohiro's deadly ability to bring drawings to life—not only is he descended from Kami, the ancient Japanese gods, but he is the heir to a tragedy that occurred long ago, a tragedy that is about to repeat. Even as the blood of a vengeful god rages inside Tomo, Katie is determined to put his dark powers to sleep. In order to do so, she and Tomo must journey to find the three Imperial Treasures of Japan. Gifts from the goddess Amaterasu herself, these treasures could unlock all of the secrets about Tomo's volatile ancestry and quell the ink's lust for destruction. But in order to complete their quest, Tomo and Katie must confront out-of-control Kami and former friend Jun, who has begun his own quest of revenge against those he believes have wronged him. To save the world, and themselves, Katie and Tomo will be up against one of the darkest Kami creations they've ever encountered—and they may not make it out alive. This the third book in Amanda's Paper Gods series. Book #1 is Ink and book #2 is Rain. Thank you so much for the awesome giveaway! I just read Amanda Sun's RAIN and I can't wait to read the third in the series!